Can you spot the parrot on the loose? 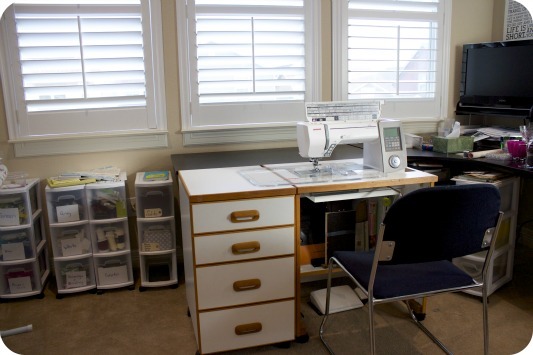 I've gotten so many nice comments about my overhauled spare bedroom sewing space (aka The Clubhouse) that I thought ya'll might like to see it set up for some serious (if still completely amateur) free motion quilting. Taadaa! Since the sewing cabinet and the drawers are on wheels, I just pull them out into the middle of the room, and slide the Ikea Galant table behind it for some extra quilt-supporting real estate. Here's what it looks like with a quilt on it. 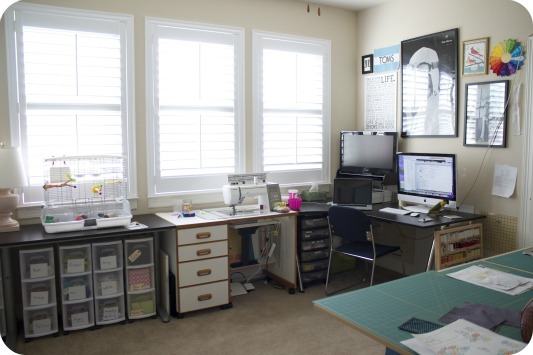 I really like this set up for quilting and for attaching binding. Both are times when I really don't want a bunch of floppy quilt weight putting unnecessary strain on the needle or making it harder for me to move the quilt where I want it to go. 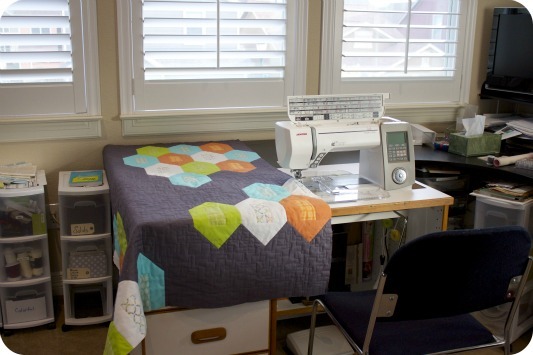 Cristy's offering 20% off through March 24th in honor of National Quilting day. You don't even need a coupon code, so go ahead and get a Supreme Slider, stock up on a couple of Quilt Halos, some rubber thimbles, glue tips, and hand appliqué needles while you're at it. I bought the quilt halos from the very sweet Christy at QuiltCon and they are awesome! Totally helping me power through a huge quilt I'm working on. Totally jealous of your setup! Supreme Sliders are a MUST HAVE for FMQ. I'll have to look into the Quilt Halos...not familiar with them. Your Clubhouse is fabulous - such a happy place! I just got a Queen Supreme Slider from Cristy at QuiltCon and am looking forward to trying it out! Now I just need an awesome Clubhouse like yours instead of a small corner of the living room!